#OtherworldlyWords returns with craven. 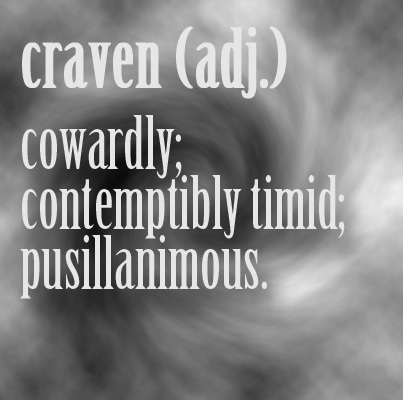 Craven is the first in a group of words this month expressing fear or cowardice. In my opinion, the most interesting element in these words is how closely words for cowardice are tied to overall moral character. Many of the words make the leap that if you are a coward, you are also morally bankrupt in other aspects. I don’t necessarily agree. I think that a healthy dose of admitting that something frightens you can help you confront it in a wise way.